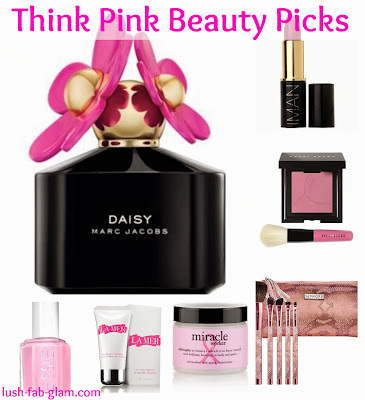 Lush Fab Glam Inspired Lifestyle For The Modern Woman: Think Pink: Shop In October For Breast Cancer Awareness. 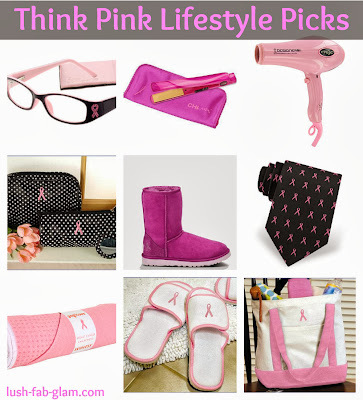 Think Pink: Shop In October For Breast Cancer Awareness. Lush Fab Glam is recognizing Breast Cancer Awareness month this October and we would like you to join us in raising awareness and shopping for the cause. This month we encourage you to think pink and look fashionably chic while supporting the fight to cure breast cancer. Read on to see our top beauty, jewelry and lifestyle picks that include limited edition products and collections with proceeds from your purchase donated to Breast Cancer Awareness. Left: Marc Jacobs Daisy Eau de Parfum, Essie Pink About It Nail Polish, La Mer The Hand Treatment, Miracle Worker Anti-aging Moisturizer. Right: Bobbi Brown French Pink Blush Set, Sephora Together In Pink Brush Set, IMAN Lip Stain-Pink. 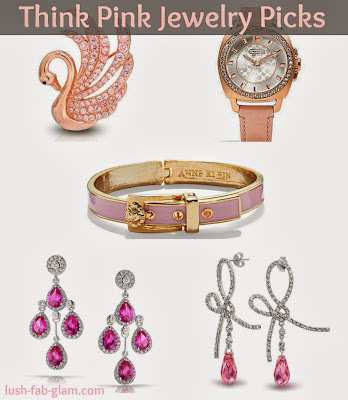 Top to bottom: Rose Gold Swan Brooch Pin With Pink Topaz, Mini Boyfriend Watch by Coach, Anne Klein Bracelet, Crown Tear Drop Chandelier Earrings-Pink Topaz Pink Diamond Ribbon Drop Earrings. Top: ICU Eye Wear, CHI Air Ceramic Flat Iron, Croc AC Designer Dryer. Center: Cosmetic Set, UGG Women's Rasberry Rose, Pink Ribbon Tie. Bottom: Manduka rskideless Yoga Mat, Slippers, Pink Tote Bag. Help others participate in Breast Cancer Awareness month by sharing this post.